If you have a portrait, favourite scene, house, street scene or a landscape in mind, I would be happy to discuss painting a special commission for you. Both private and corporate commissions are welcome. A portrait is a special, unique and very personal art piece. 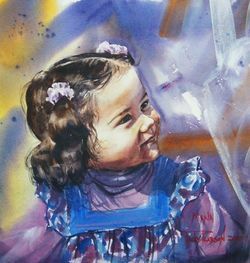 I work carefully to ensure that your painting will be a true portrait that captures likeness and personality. I want you to have a portrait that you and your family will treasure for generations to come. All my watercolours are painted with Winsor and Newton's most durable lightfast pigments. They are painted on 100% cotton rag paper. Modern watercolours should last as long if not longer than oil paintings, hundreds of years. Expert framing can be arranged if required or the painting can be supplied unmounted for you to make your own arrangements. In the event your painting needs to be shipped, there will be an extra charge for packing and shipping costs. If desired, an unframed painting can be sent by cardboard tube with the framing costs deducted. Arrange a visit to the Studio to discuss your requirements or contact me with your watercolour commission enquiry.